"nerdy shirts" - Blog @ That Awesome Shirt! Click here to see our top picks or shop directly at NerdyShirts. Price reduced by 20% for all items except for new shirts. 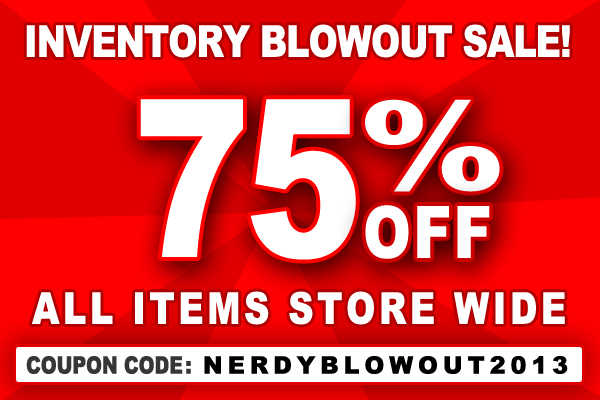 Stock your cart with our favourites or check out nerdyshirts.com. See our favourites or nerdyshirts.com. Nerdy Shirts: Holiday Blowout Sale 10%-50% off EVERTHING! Finally, a nice good ol' fashioned non-coupon sale! Lasts for a week only, so should end around 30-31st July, 2011. Sale ends 19th May, 2011. Not sure when this ends, but it definitely wont get to you before xmas anymore. You can still grab a good bargain though!